The remaining six women nominees for U.S. Senate seats face strong headwinds going into November. According to the Cook Political Reportratings, the Arizona race in which Ann Kirkpatrick (D-AZ) bids to oust Senator John McCain (R-AZ) is leaning toward the incumbent. Patty Judge (D-IA) is rated likely to lose her challenge to incumbent Senator Chuck Grassley (R-IA). 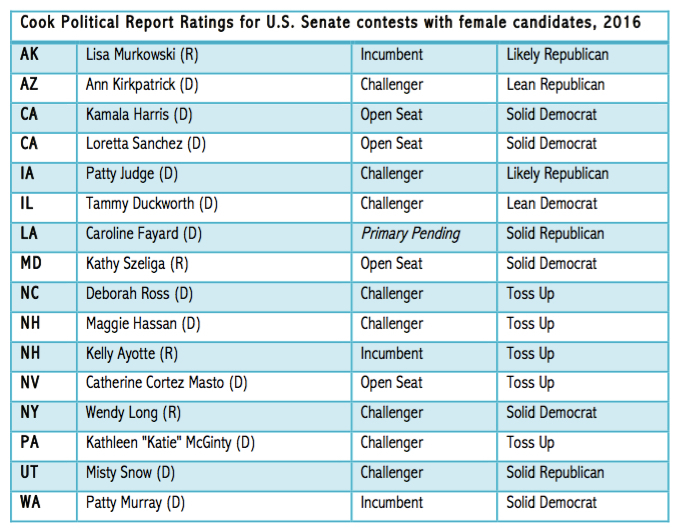 The contests of three more women nominees – Kathy Szeliga (R-MD), Wendy Long (R-NY), and Misty Snow (D-UT) – are rated solidly in their opponents’ favor. Finally, while Caroline Fayard (D-LA) is still in the running for Louisiana’s Democratic Senate nomination (to be held on November 8th), that seat is considered solidly Republican.